United Conservative Party leader Jason Kenney speaks at a rally before the election, in Sherwood Park, Alta., on Monday April 15, 2019. Now there are not one but two premiers clamouring to defeat Justin Trudeau, openly, directly and noisily. The election of Jason Kenney as Alberta Premier brings a second scoop, on top of Ontario Premier Doug Ford, of open warfare between provincial capitals and Ottawa. The problem for the Prime Minister isn’t just that he has another provincial leader tearing apart the last shreds of what was once a nearly-unanimous “Pan-Canadian framework” on combatting climate change or that there are now (arguably) six small-c conservative provincial premiers where once he faced just one. It’s that Mr. Kenney plans to join Mr. Ford in loud, open attacks not just on federal policy, but on the Trudeau brand. And it comes at a time in Mr. Trudeau’s tenure when he is no longer succeeding in dominating the national political narrative. Mr. Trudeau has been struggling to impose his own agenda on national politics for many months, since the closing of the NAFTA 2.0 deal last September. Can you recall the March Liberal budget? Do you hear people talking about the carbon-tax rebates that amounted to hundreds of dollars for residents of four provinces on their latest tax returns? Maybe not, but if you live in Ontario, you have heard talk of Mr. Ford’s plan to force gas stations to put anti-carbon-tax stickers on their pumps. And now here comes Mr. Kenney, promising to join in. Some of his campaign gimmicks were just that. You have to wonder if Mr. Kenney will find a way to back out of the promise to hold a referendum on equalization, since the system was supported by the federal Conservative government in which he served and a referendum won’t do anything except put Conservative Leader Andrew Scheer in a tight spot. But Mr. Kenney is the kind of politician who will want to come out of the gates fast as Premier, with the plan to scrap Alberta’s carbon tax likely to be one of the first things on the agenda. A legal action to contest the federal carbon tax “backstop” probably will follow quickly. 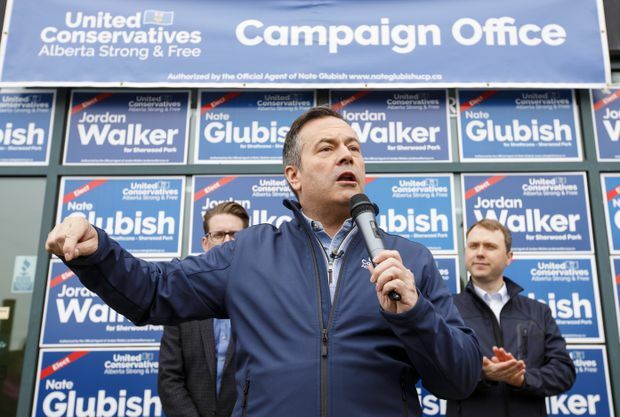 Alberta election 2019: Economic worries trumped concerns about UCP. Now what? And then Mr. Kenney will be out travelling Alberta and the country campaigning against the carbon tax and against Mr. Trudeau himself. That last part will probably be just as popular in Alberta as the first. It’s not necessarily a bad thing in itself for Mr. Trudeau to have a few high-profile conservative adversaries. Mr. Scheer doesn’t really have much of a track record or a set of policies yet. So Mr. Trudeau lumps him in with conservative politicians who the left-leaning feel strongly about, such as Mr. Ford. If anything, the election of Mr. Kenney, a recognizable face from Stephen Harper’s federal government, should make it easier for Mr. Trudeau to warn – as he intends to do – that if he is not re-elected there will be a rerun of Mr. Harper’s Conservative era. And Mr. Trudeau can have some hope that a pitched battle over carbon taxes can convince environmentally-conscious voters – including those who might prefer to support the NDP or the Green Party – that they face a choice between his Liberals and Conservatives who won’t make serious efforts to reduce greenhouse gas emissions. But there’s still a real problem. When Mr. Trudeau talks, he’ll have two prominent premiers shouting. They might drown him out. Back in 2015, at his first premiers’ conference, Mr. Trudeau had a group of Liberals and New Democrats singing about the need to act on climate change. The objection of Saskatchewan’s then-premier Brad Wall was on a different page and barely came through the chorus that carried Mr. Trudeau’s message. Now there’s a lot more noise over Mr. Trudeau’s voice. Mr. Ford regularly warns – incorrectly – that the federal carbon tax will make everything a lot more expensive for the average person. He never mentions the rebates. Mr. Trudeau does. But now he has a lot more competition to be heard.